We love sharing crafts for toddlers and we know you love them too, it’s such a lovely age to enjoy doing activities together! 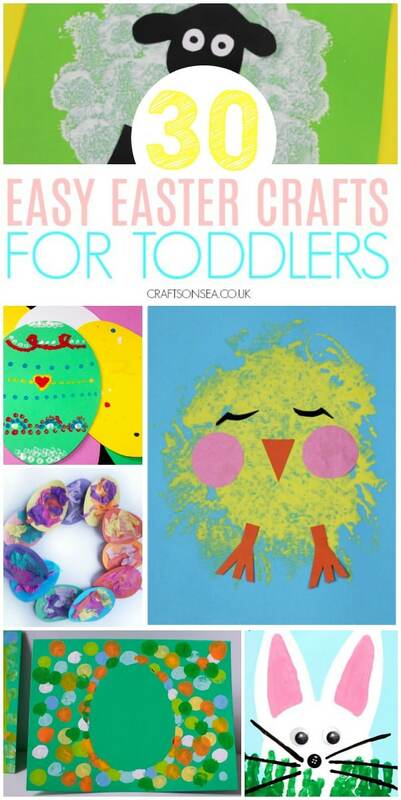 The Easter crafts for toddlers I’m sharing with you today are all designed to be easy, achievable and most importantly fun. In this post you’ll find lots of inspiration including rabbits, sheep and of course Easter eggs with loads of ideas to help you and your children have the best Easter ever. 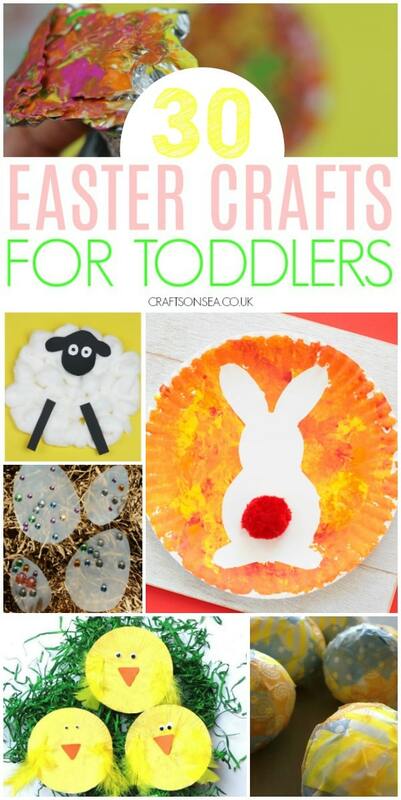 In this post you’ll find lots of Easter crafts for one, two and three year olds. As I’m sure you know there’s a lot of difference between what a child who is one can do and what a child who is three can do (and a lot of difference between children the same age too) so take a look through and see which ones are the best suited to your childs age, abilities and most importantly to their interests and what you think will be the most fun for them. Some also require a bit more set up than others too and it’s always worth a think about how much time you want to spend doing that! As there are quite a few crafts in this round up I’ve listed them in the same order that you’ll find them in the collages below, there are more ideas than are shown in the collages though so do take a look through the list as hopefully you’ll find lots of new ideas to keep your kids entertained! 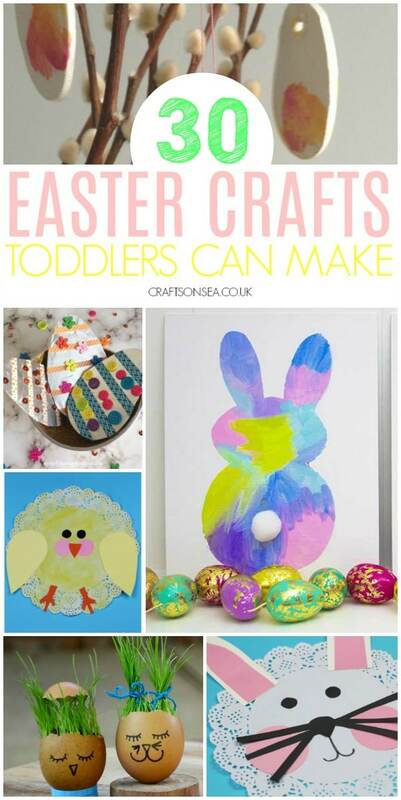 As well as the crafts I’m sharing today you’ll also find some ideas for Easter books to share with your child and some more of our favourite crafts for toddlers. PLUS – if you have a toddler you’ll know how hard it can be to get anything done, like, ever?! It’s ok to just want 20 minutes of quiet so you can get stuff done so we’re joining in with the FREE 5 Day Independent Play Challenge which starts on Monday 22nd April. Click here to find out more and join us for some guilt free time when you can get stuff done while your kids play! Like the ideas in this post? Make sure that you bookmark this page or pin an image so that you’ve got them all to hand when you need them. Grab the free printable and make this simple foil printed Easter egg craft. This easy sheep craft is perfect for little hands who can grab hold of the cotton wool. Reuse old milk cartons to make this Easter egg craft for toddlers. This rabbit craft from Non-Toy Gifts is a great idea for younger kids to make. My Bored Toddler has a simple Easter chick craft that’s perfect for little hands to make. My son enjoyed making these washi tape Easter eggs. This sheep craft for toddlers uses a fun painting technique and is good for kids that don’t like finger painting. 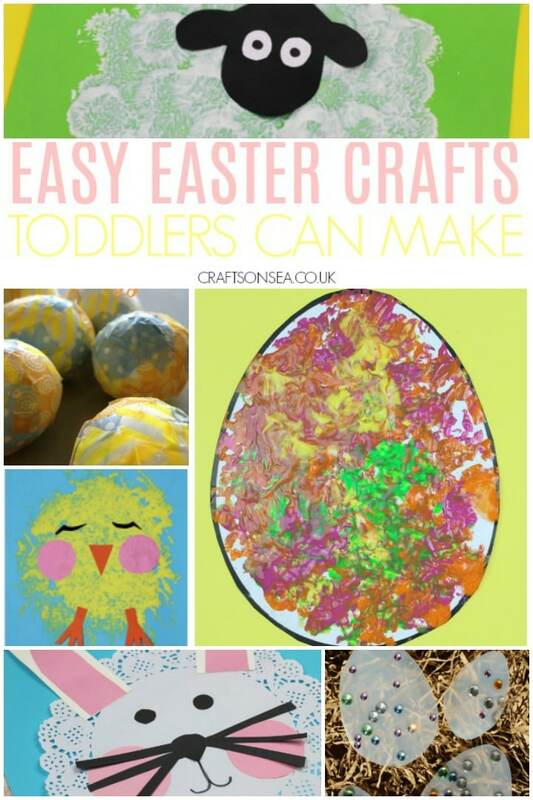 This cotton bud printed Easter egg craft from Messy Little Monster is great for toddlers to make. My kids decided how they wanted to decorate this Easter Egg wreath and their ideas worked really well – tissue paper is a great material for toddlers to use! This easy chick craft would look good on the front of an Easter card too. Fun Handprint Art Blog has a really nice and simple Easter egg card that toddlers can make using fingerprints. If your child likes handpainting then this rabbit one from Fun Handprint Art would be great and would look lovely on the front of a card too. My toddler enjoyed making these Easter tree decorations and it was nice to be able to hang them up and display them afterwards too. I love these aluminium foil eggs from the Joy of Sharing and think they’d look great on a card too. Grab the paints and make this cute doily Easter chick. My Bored Toddler has a bunny painting activity that even very young kids can do. Create some Easter themed grass heads like these ones from Mother Natured for a cute craft that kids can keep and look after. Toddlers can enjoy gluing on different shapes to make this cute doily rabbit and older toddlers can help cut them out too. Make an easy chick craft from recycled CDs. We made Easter egg prints using potatoes – adding ‘grass’ for our eggs to be hidden in was a good way to practice scissor skills too. Make a sponge printed sheep craft. Make a paper plate rabbit like this one from the Best Ideas for Kids. Follow The Best Ideas for Kids tutorial to make a paper plate basket for Easter eggs. Red Ted Art shares some super cute rocking paper plate bunnies. Make a cute Easter card with these cotton wool rabbits from Red Ted Art. Create some thumbprint rabbit art with this idea from A Dab Of Glue Will Do. Fun With Mama shares a cool plastic egg painting idea. If you like making cute keepsakes then Messy Little Monster has a very sweet template for making bunny footprints. Make a tape resist watercolour cross following this tutorial from Wunder Mom. Twitchetts have a great Easter egg card that’s a good way for kids to practice their scissor skills. Follow Hands On As We Grow’s tutorial for making marble printed eggs. I love sharing stories with my kids and I think Easter is a great excuse to snuggle up together with your children and read a book together. These books might make lovely additions to an Easter basket too! Looking for something to do once the excitement of Easter is over? 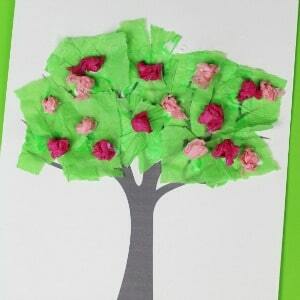 Why not grab our free tree template and try out some of our ideas for easy spring tree crafts. 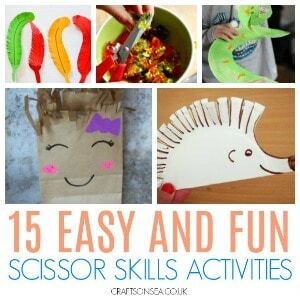 These fun scissor skills activities are the perfect introduction to the skill. 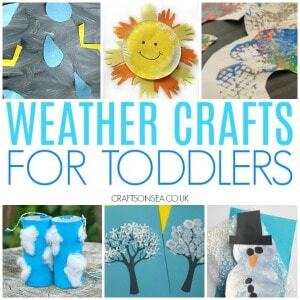 Finally why not try out some of these easy weather crafts for toddlers – perfect for cheering up a rainy afternoon.